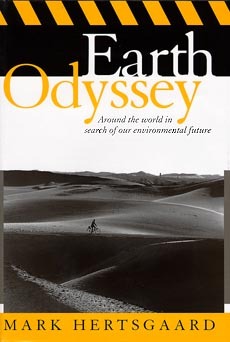 Earth Odyssey: Around the world in search of our environmental future by Mark Hertsgaard (Broadway Books, 1999) is available online and in brick & mortar bookstores. Hertsgaard is one of the most clear, and fiercely independent thinkers heard in the media today. From the pages of The New York Times, The New Yorker, Vanity Fair, Harpers, Esquire, The Nation, Newsweek, and Rolling Stone, Mark has spoken truth to power and given rich and factual context to the critical issues of our time. He is also the author of the acclaimed books, On Bended Knee: The Press and the Reagan Presidency, and A Day of the Life: The Music and Artistry of the Beatles. For Earth Odyssey, Hersgaard traveled to 19 countries in six years to answer the question: Does humanity have a place in the ecological future of the planet? As the reader will soon discover, the real source of understanding was in the people that he met and the wide range of cultures that he experienced. Mark makes a rock stready and tenacious guide on a tour of ecological catastrophe in the making, and introduces us to a cast of characters and conditions that are pushing it to the brink. He explores the thoughts of Vaclav Havel, Al Gore, Jacques Cousteau, and others as he looks deeply at automobile addiction, proliferation of nukes, and the clash between the market economy and global ecological health.